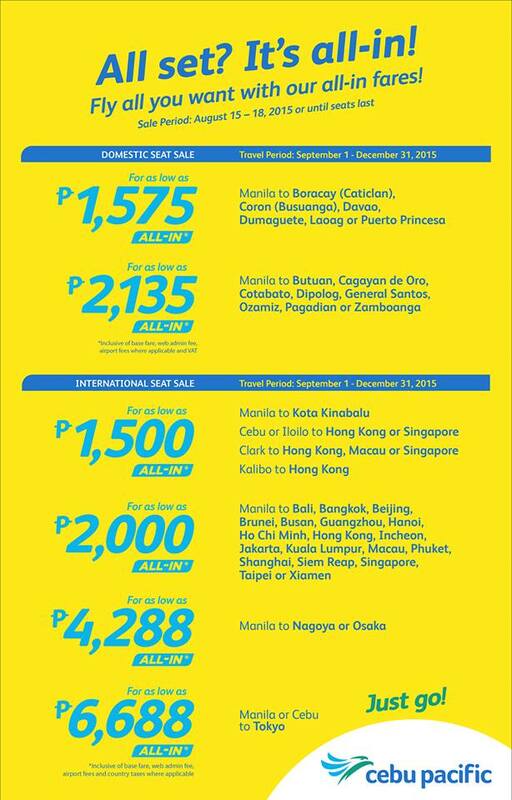 Cebu Pacific Promo Fares 2019 to 2020: Promo Fare Going to Boracay and other Destinations! Promo Fare Going to Boracay and other Destinations! Cebu Pacific Promo Fare: All set? It's all-in! Fly all you want with our all-in fares! Quoted fares are valid for one-way travel only. Inclusive of 7 kg hand carry baggage allowance, base fare, web admin fee and all taxes collected at point-of-sale. Terminal fees for non-Manila stations and Php 1,620 International Travel Tax must be paid at the airport. Promo fares have limited availability and are non-refundable but rebookable subject to the following rebooking fees: Php 1,500 (domestic), Php 2,300 (short haul) and Php 2800 (long haul) plus fare difference. For your convenience, flight changes, availing of prepaid baggage allowance for check-in baggage and self-check-in services can be done up to four hours before your scheduled flight. All International flights (except China and Long-haul destinations) may only be availed online at cebupacificair.com. hi po ung going davao ba ksma ng baggaes nyan one lng po ba yan?